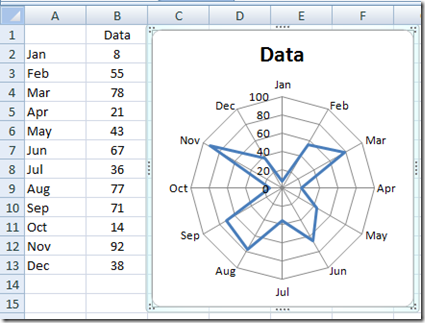 It is actually kind of a simple solution that can be used in many different Excel applications. 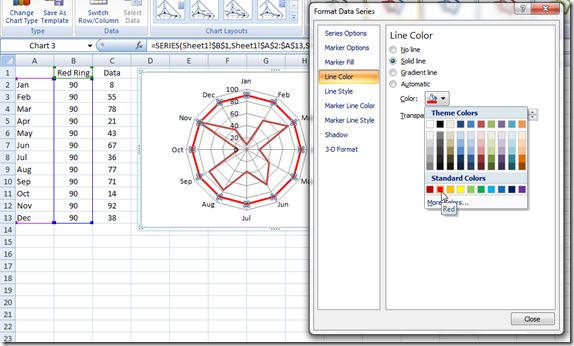 In the Sample Excel Radar Chart below, you can see that I have colored in all the Excel Radar chart rings in a gradient fashion to highlight the various sections. Let’s get started and see how you can make this type of Radar Chart for your Executives in your next Company Dashboard. 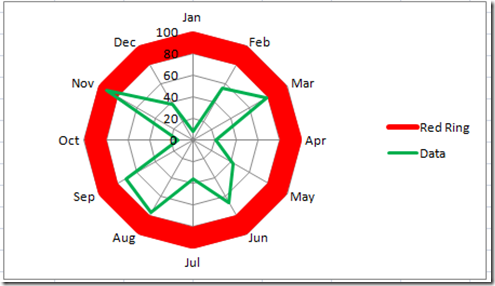 1) Add an additional series to your radar chart so that is in the middle of the ring you wish to highlight. 2) Move the additional series up so that it is the first series in the chart. 3) Change the additional series line color to Red. 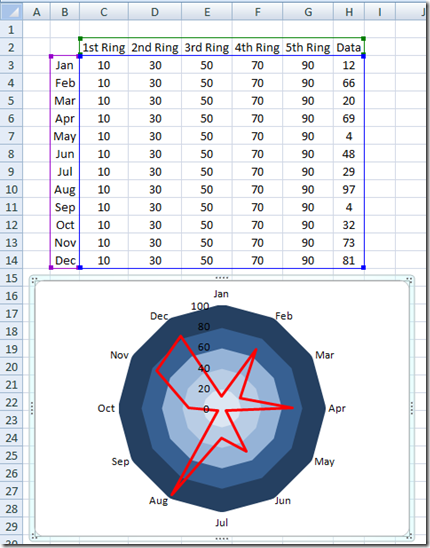 4) Increase the point size of the additional series line so that it fills up the ring of the Radar Chart. 5) Wow and amaze your executives as they drool over your really cool Excel Charts in you Company Dashboard. 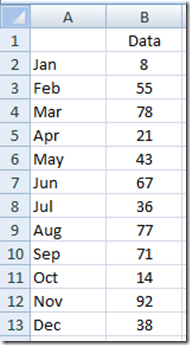 Here is a step-by-step on how-to make this chart in Excel. Following this is a free sample tutorial file as well as a video demonstration. But we need to add an additional series that will be right in the middle of the last ring. 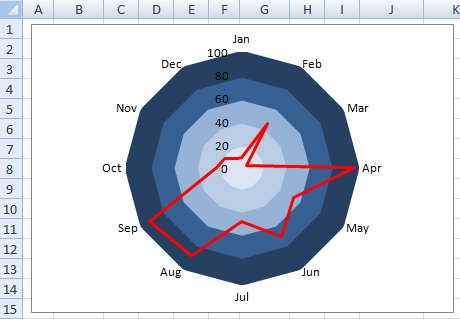 If you don’t know what that value will be, well, just make a quick Radar Chart and see what are the last ring values. In our case, the last ring goes from 80 to 100. 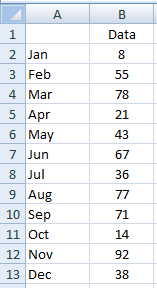 Therefore, we need to add another series that is between those numbers (in our case 90) for all categories. 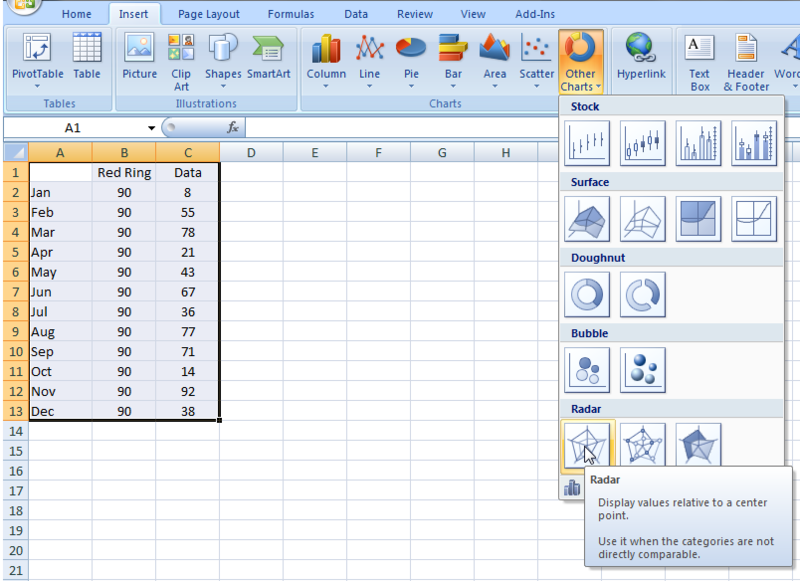 This is the easiest way to create this Excel Radar Chart with this additional colored ring. Alternately, if you need to keep your data and categories intact and add therefore the Red Ring series is to the right or your data series, you will need to follow the step 3. 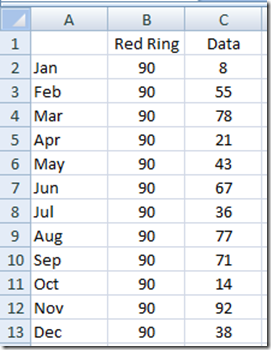 2) Skip this Step if you were able to set up your data so that the Red Ring series is the first column of data after your Chart Categories. 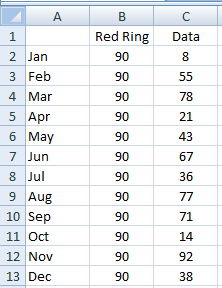 This is an Alternate step that is only needed if your Red Ring data series in the Radar Chart is not the first series after your chart categories. 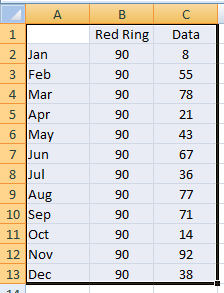 We need to make sure that the Red Ring series is the first data series in the Legend Entries (Series). You can do this by selecting the chart, then click on the Design Ribbon and then Click on the Select Data button in the Data group. Then move the Red Ring series to the top by clicking on the Move Up button. We need to do this so that the colored radar chart ring will not overlap our actual data, thus hiding or obscuring the data from chart. 3) Okay, we are getting real close, so lets change the Red Ring series line color to Red. 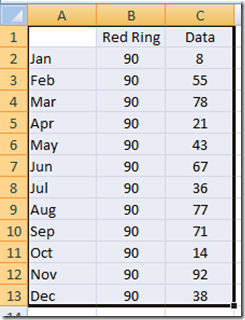 You can do this by clicking on the chart, then Right click on the Red Ring chart series and choose “Format Data Series…” from the pop-up menu. 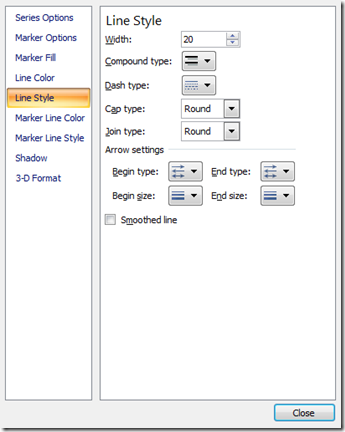 Then choose the Line Color group in the Format Series Dialog Box, choose Solid Line radio button and then choose Red from the colors. 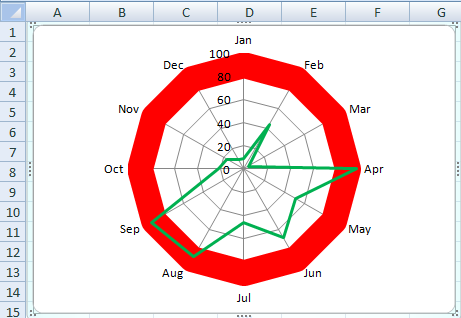 4) Now, the only thing left for us to do is to fill up the Excel Radar Chart Ring section with the color red. 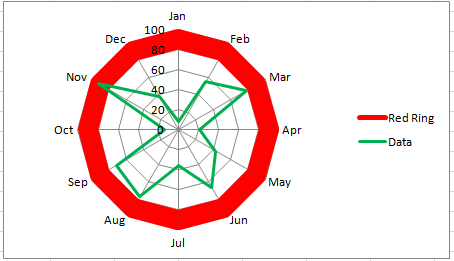 To do this, we need to increase the point size of the additional series line so that it fills up the ring of the Radar Chart. 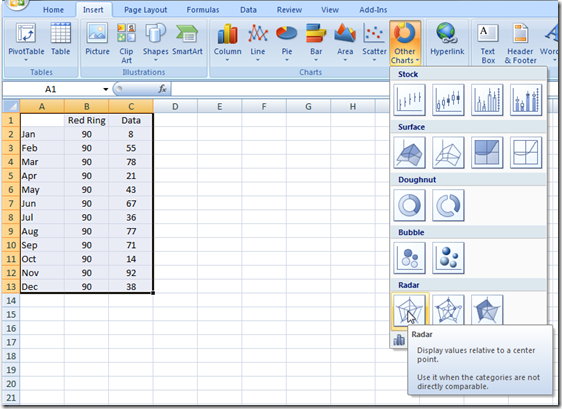 Right click on the Red Ring data series and then choose “Format Data Series…”. 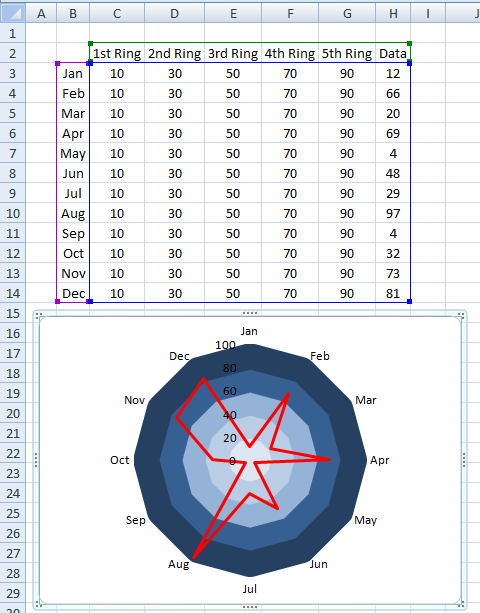 Then choose the Line Style sub menu and we need to change the Width so that it fills up the Radar Chart Ring. In our case, it is find to put in anything between 15 and 20. 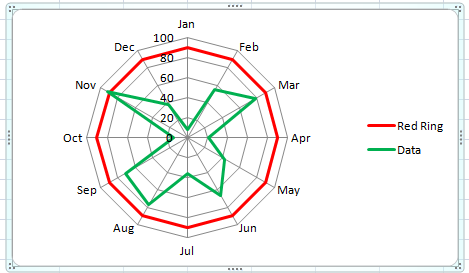 As you can see, this highlights our upper ring of our Excel Radar Chart. You can use this Excel Chart technique to fill each of the Radar Rings. If you want to do this, you need to create a data series in the middle of each Radar Ring and then follow the Excel Trick above. 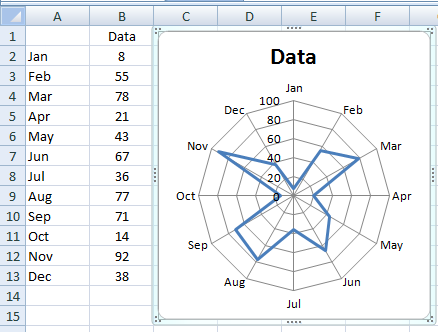 Here is a sample of how I set up the data to color each Ring of the Excel Radar Chart. 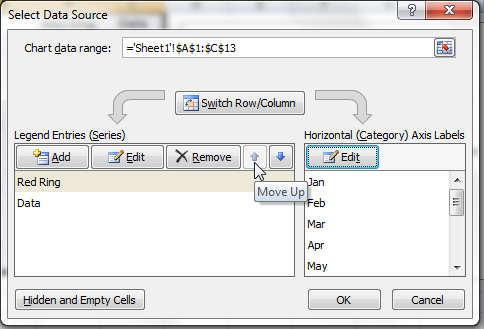 This is a great way to highlight a specific Radar Ring in Excel Dashboards and you can use this tip in your next Dashboard Template. 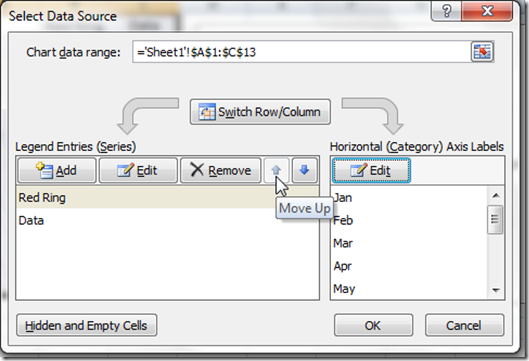 Please let me know how you think you can use this Excel Tip and Trick in your next Excel Executive Dashboard in the comments below. I’m glad you made this Tutorial. I just completed a Lighting upgrade in my facility and want to show the before/after lighting levels overlaid on color bars with recommended lighting levels. I haven’t tried your instructions yet, but it looks like this is exactly what I will need. Thank You. 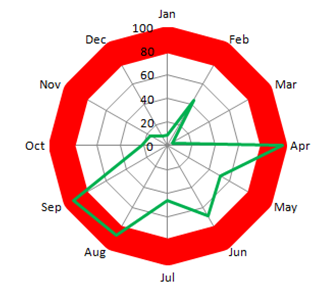 Is it possible to colour the gap between two variables / lines on a radar chart? Hi TH. 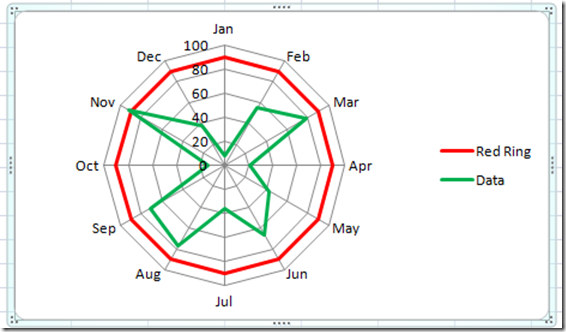 It cannot be done with the standard Radar Chart. You would have to make it with an XY chart and would take some work. Hi Amber, yes you can delete it. Simply select the chart, then select the legend, then select the legend entry and then press the Delete key on your keyboard. Hi, Steve. Great post! Thank you. 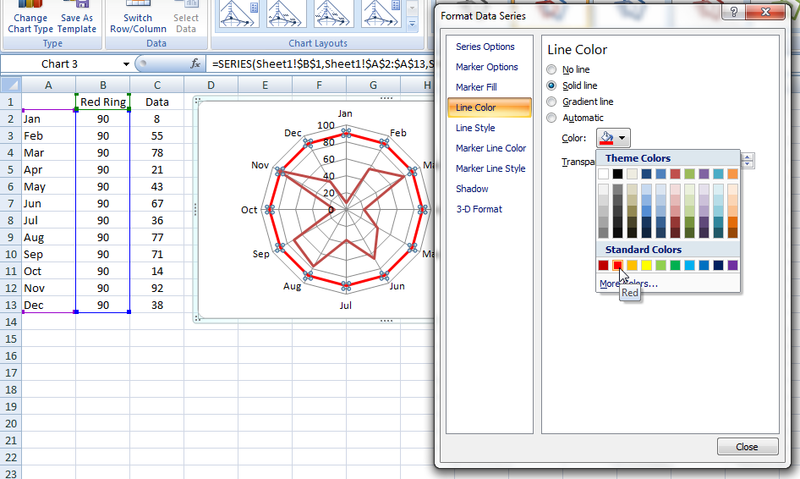 I successfully created a radar chart with colored bands for each series. I chose to have the join type be Miter as opposed to Round. However, the last category in each series refuses to be a Miter join. It’s round. So in my 5-category radar chart, one of the categories (the last in the list) has rounded corners and the rest have mitered corners. When I add a 6th category, the rounded corner goes to the 6th category. Any idea how to fix this problem? Hi David, I am not sure on this one as i don’t typically use miter/round. Any fix i can think of might cause additional problems as you already did.